Historic Forest Park Carousel re-opens to the public on May 26, from 11 a.m till sunset. WOODHAVEN — An historic carousel will spring to life this Saturday, giving Queens residents the chance to saddle up for a ride. The more-than-century-old Forest Park Carousel will reopen after a five-year hiatus, with new features and a polished look, the Parks Department said. Another carousel at Flushing Meadows Corona Park also opens this weekend. Both carousels will be open from 11 a.m. till sunset and will operate each weekend until late June, the department said. After that, they will be open daily through Labor Day. Visitors to the Forest Park Carousel will not just see newly polished floors, but also new clear lightbulbs that replace the former multicolored ones, Chekmayan said. “This looks more authentic,” he added. An old wrought-iron fence that separated the carousel from its audience has been removed, replaced with a sleeker modern fence so parents can watch their kids having a spin, Chekmayan noted. 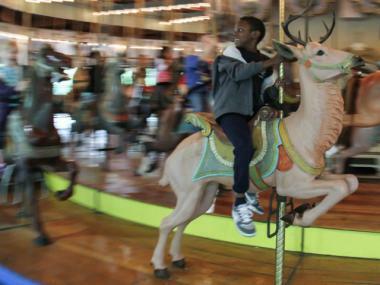 This is the first time since 2008 that the Forest Park Carousel has been open to the public. It debuted more than 100 years ago, in 1903, in Dracut, Mass., according to the Parks Department. Designed by master craftsman Daniel Muller, the carousel contains 49 handmade horses, two chariots, a lion, a tiger and a deer. Just two of the 12 carousels designed by Muller are currently in existence — the one in Forest Park, and another in Cedar Point, Ohio, according to the concessionaire’s spokesman. Visitors wishing to take a ride should plan to bring their own food, though, as the site's snackstand has not yet been set up. "Yes, we’re still working on it,” Chekmayan said. The city of New York has only four other park carouselsincluding one in Central Park and another in Prospect Park, according to the Parks Department.